CREEC Youth Group was very productive this month; we worked a total of 13 days. Most of our time is spent weeding. There are always weeds to go after in potted plants, demonstration gardens, fence lines, or pathways. Next time grabber is the seedlings of the moment. Everything from grass to trees sprouts this time of year. Along with the toyon and milkweeds and oaks of many kinds, CREEC also has tomatoes, peppers, eggplants, okra, Egyptian walking onions, pumpkins and a wide range of herb plants for the garden. My hope is that people stop at CREEC first to see if their garden’s needs might be met and see also our beautiful Native and drought tolerant plants. May also brought a lot of clean-up and reorganizing. We succeeded in filling the recycle, non-native green waste, and trash cans every week. We cleaned out sheds and reorganized some pot storage areas. There is still a lot to work on, but we think we’ve made a difference. The most important project that CREEC Youth worked on was picking out the plants and trees for our Restoration Project on the property located just before the CREEC Greenhouse property owned by C&H Sugar! We pulled, weeded, and staged about 200 trees and plants for the project. All of us are VERY excited that our plants are out of pots and into their own soil, to grow and be beautiful for all to see on Dowrellio Drive in Crockett! We will be mulching the newly planted area as soon as possible as they were planted on June 3. The class from Carquinez Middle School that visited in April from Ms Wesselman’s math-science class, came again. Although only 5 students chose to return, they were very motivated and happy to get busy and pot up some valley oak seedlings. Then they spent some time weeding, racing to see who could fill up a 5 gallon pot first of 5 specific non-native invasive weeds. Then we all looked at the okra and marigold seedlings that they potted up in April, excited that they were plants ready for the garden. After they went to see the fish pond and went back to school. I hope they had as much fun as I did! The following students participated at CREEC in May:Tony Neely, Jr.
Richard Moody provided services in tool repair and maintenance. Thank-you for allowing CREEC to be such a big part of our world! We are most excited to be a part of the new restoration! The Carquinez Regional Environmental Education Center (CREEC) is a state and federally recognized, tax-exempt, 501(c)(3), public interest charity incorporated in 1995. The role of this nonprofit organization is to effect wildlife habitat and enhancement, maintenance and restoration projects in the communities and open lands surrounding the Carquinez Strait – Californias most significant wildlife migratory corridor. The sole goal of CREEC is the betterment of the areas natural resources through cooperative, constructive and mutually beneficial partnerships with the industries, families and agencies who live and work along the Strait. The CREEC Youth Program is dedicated to environmental improvement in the Carquinez Strait region. 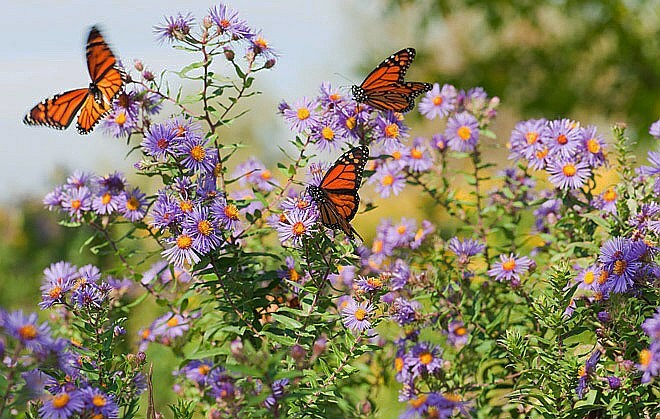 Students participate in habitat restoration, native and butterfly plant propagation, and butterfly rearing and release. Participants earn a stipend for their participation, after completing 10 volunteer hours. The program started in 1998 and initially included five students for a 10-week summer project. It has expanded to a year-round opportunity for youth to earn while they learn by improving the surrounding community and open space. Tasks are designed to create a hands-on learning experience in environmental restoration, basic horticulture, environmental science, non-profit management, and basic work skills.